(GEUMSAN=Yonhap News) Geumsan-county, Chungnam-province has been actively pioneering new global markets for Geumsan's ginseng. Geumsan county said on March 18 that it has been endeavoring to diversify export channels by discovering foreign buyers and expanding network. It continues to conduct promotion marketing in countries with high preference for ginseng, while pioneering new markets in ginseng-consuming countries. For instance, the ways it sought to increase exports include: sending a trade delegation; cooperating with the Korea Agro-Fisheries and Food Trade Corporation(aT); selling online; discovering foreign buyers; and establishing network. The county participated in the International Exhibition for Food, Beverages and Food Raw Materials (ProdExpo) held in Moscow, Russia and sought for exchanges with Wasabi organization in Shizuoka Prefecture, Japan. The 26th PROD EXPO is the largest food trade fair in Russia and Eastern Europe, covering 22 themes including ginseng, food, beverage, etc. 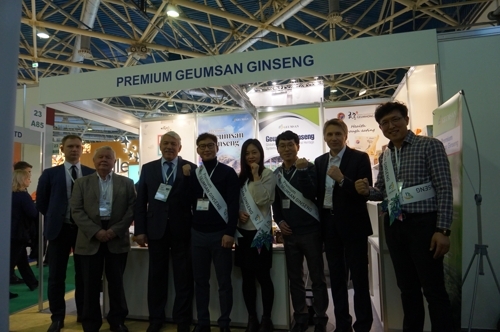 More than 500 foreign buyers visited Premium Geumsan Ginseng booth, resulting in about USD 800,000 export agreements with five foreign companies. The county is working on promotion marketing in emerging ginseng-consuming countries such as France, Australia, Indonesia and Thailand. Mayor of Geumsan country said, "We will focus on opening new markets by raising awareness of Guemsan ginseng through business meetings, promotion seminar, and invitation of promising buyers."